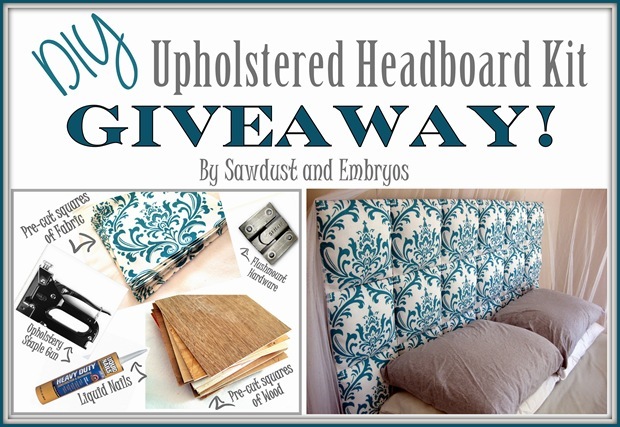 This upholstered headboard is SO SIMPLE and easy to make… and I’m gonna share the how-to tutorial with ya!! 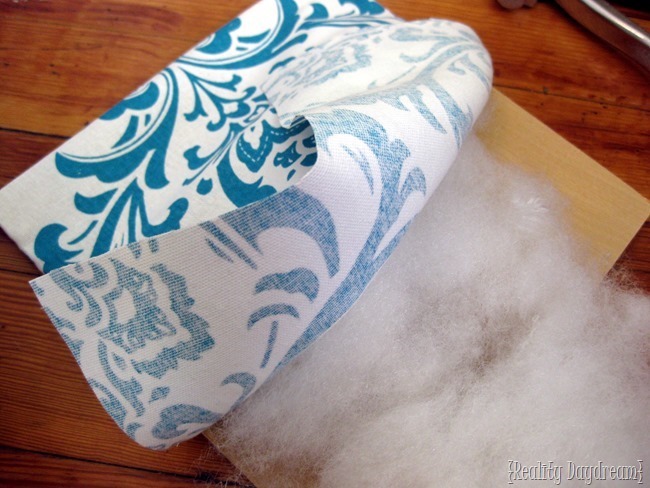 The following tutorial is for a queen size upholstered headboard. You can tweak it accordingly for other bed sizes. If you don’t have a table saw, start with having your local lumber yard cut 18 squares (10×10) of 1/4″ wood. We used Mahogany underlay because it was cheapest. You’ll also need a 1/2 inch thick board 28″ x 58″ to serve as the ‘backboard’. I started by cutting my fabric in 13″ squares, 18 in all. Then I lined up the 10″ board on my fabric so that the design was perfectly centered. 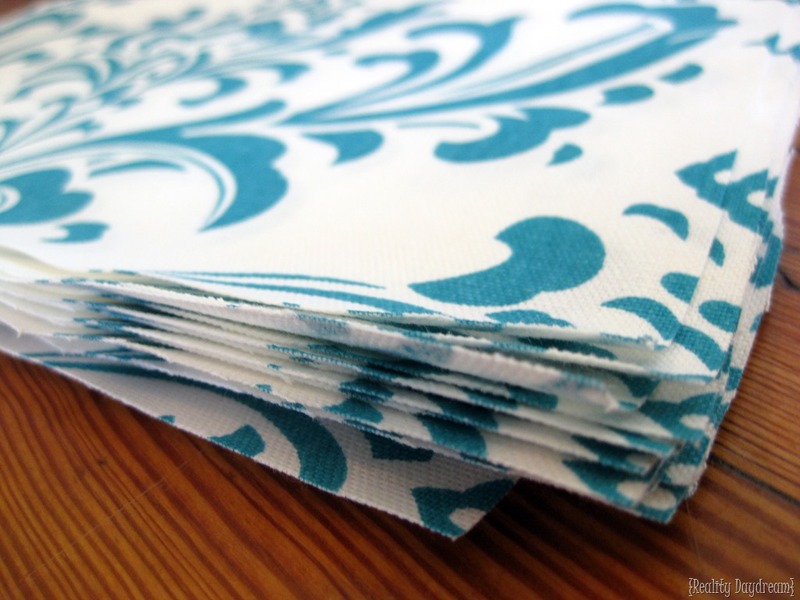 If you’re not using a patterned fabric, you don’t have to be as careful with centering and lining everything up just so. Make several tiny folds on the corner, and pull it tight to make a perfectly smooth corner… and staple it down! I added some fluffy polyester fiberfill a little at a time, adding staples every 2-3 inches as I made my way up the square. I cornered off the top the same way I did the bottom. Voila! One down, seventeen to go! Once you have one square completed, use it as a template for the rest… making sure the pattern lines up the same way in the same places. 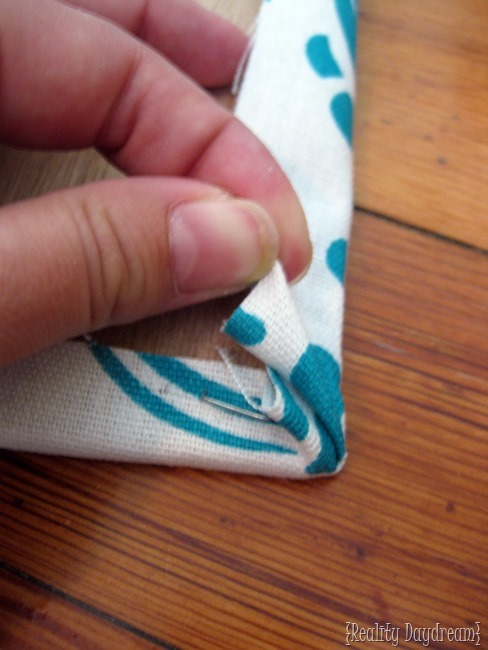 But like I said, if you’re using a solid fabric, or lots of different patterned fabrics, this step can be omitted! Hooray for omitting steps! Once you’ve got all 18 upholstered 10×10 boards, give yourself a high-five! No matter how perfectly your 10″ squares are cut, there will always be slight cracks showing between some of your upholstered squares, so I recommend spray painting your ‘back board’ a similar color to your fabric. Then place all 18 squares onto the board. 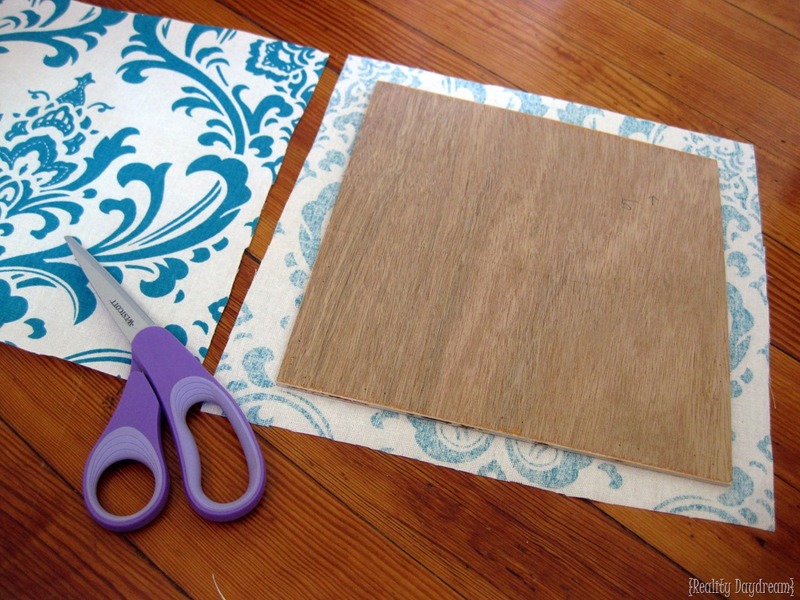 Your ‘back board’ is cut 28″x58″ so that the upholstered squares overlap on the edges so you can’t see the tacky unfinished backboard peeking out from behind. Glob on some Liquid Nails onto the back, and press each square down firmly. Be sure to read the directions carefully. This may not seem entirely secure, but we built our first headboard almost 2 years ago, and we haven’t had any problems! (TIP, try globbing some of the Liquid Nails >>this stuff onto the staples, giving the goop something to really grab onto when it dries). I so so so love how this turned out. 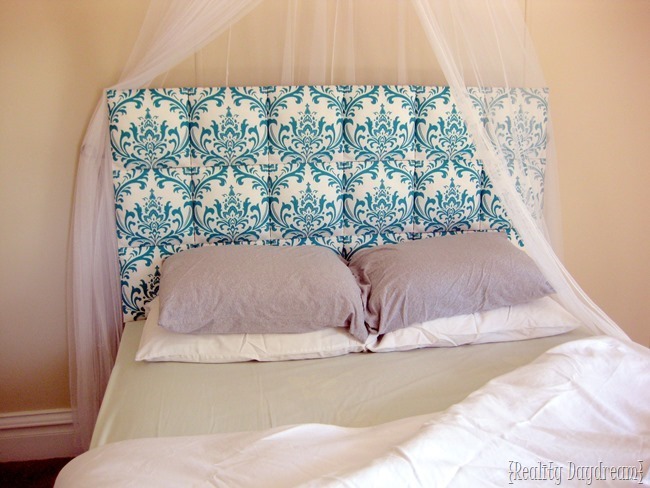 Here are some other posts from our bedroom makeover! Are you gonna give this one a try? Let me know if you have any questions!!! 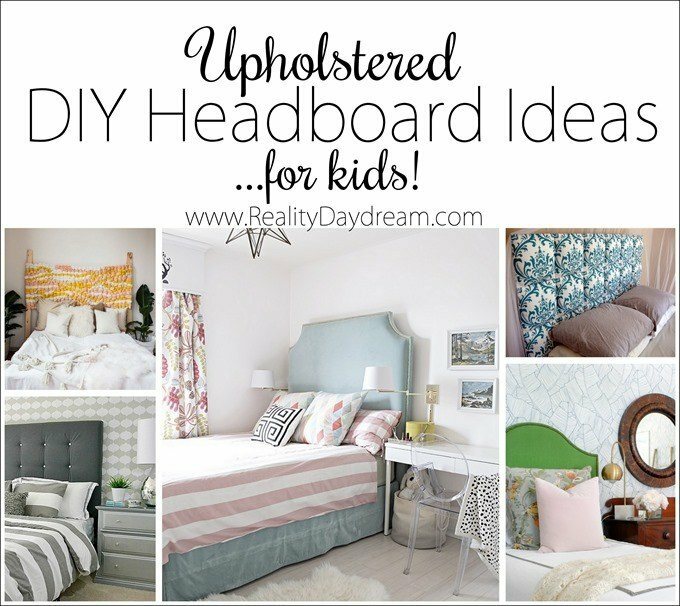 I also think this headboard would work great for a kids bed, and I included it in a roundup of ideas of Upholstered Headboards for Kids! GIVEAWAY! 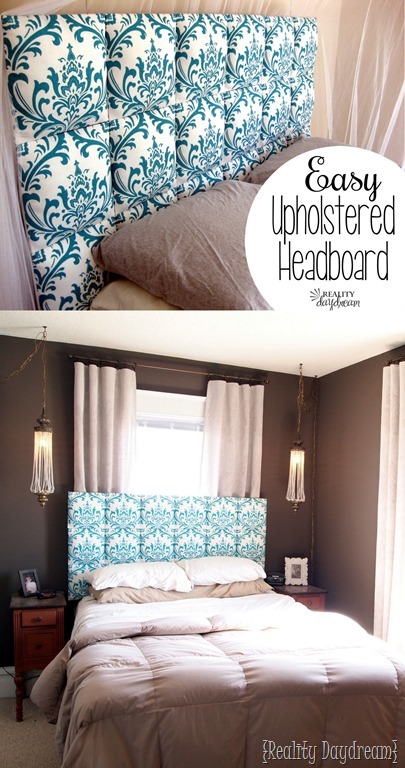 Upholstered DIY Headboard Kit! WOW!!! This is so brilliant!!! So doing this…thank you!!! I love love this. Thank you so much easier than the others I found. I have one question…what about the legs? There’s no instructions on how to add the legs unless I missed it? Hi Anna! We use flushmount hardware to mount it directly to the wall. did you attach headboard to bed frame? Mine is attached to 3 pieces of wood which is anchored to the wall. Added some velcro to the wood and blocks… So now I csn change it up if I want! It’s going to be different for everybody depending on the width of your fabric. 76″ is the width of a king size mattress, so you just have to decide approx what size and how many squares you want that is divisible by 76 (or slightly more). I made one of these, and have recently decided to change up my entire bedroom color scheme, do you know a way to redo the headboard or is it easier to just start anew and build a completely new one? kolbi, you might try to pry off the individual squares and see if they’ll pop off. If so, you could just wrap a new fabric over the old and skip the whole stuffing step! If you give it a go, let me know how it turns out!! If it works I’ll for sure let you know and post before and after pictures! Thanks! Mine is a king size that 3 rows down with 5 blocks across. Hubby didn’t want to you the bracket. So he anchored 3 pieces of wood to the wall and I put wide Velcro on the wood and the block backs so I coukd move them around. Next year I’ll be making a second set of blocks so I can change it out! I Love this idea! I’ve just got into crafting and am about to finish a diy ottoman made out of a tire aND 3/8in Manilla Roap. I looked online and couldn’t find 1 for under $500 or $600 so I’m almost finished making my own and will only have ab $40 plus the glue in it. Anyways, I was wondering if u can use any fabric you choose or if certain types work best? Keep up the great ideas and tks for posting. Oh my, how did I miss your comment?! We use upholstery fabric for things like that because it has that extra strength and durability. Would love to see pics of your ottoman!! We used one flushmount bracket on either side of the headboard. Hope this helps! Send pics when you’re done!! Did you use two of the flushmount brackets or one? where did you get the canopy?! Hi! Do you have a cost breakdown on this? Or an estimated cost? Also– how much fabric did you need? Hello! I’m new to crafting and am looking into making my own upholstered headboard. I have a queen size bed and would like to use 18×18 squares. My thought was to use 1/2in thick squares and omitting the supporting back board. Flush mounting them to the wall using a wall cleat. I have a theme in mind and have been searching for cost efficient options for durable/quality fabric. Any thoughts on using curtain panels vs fabric by the yard? Do you have any recommendations about which fabric (linen, cotton, ect.) Is best suited for diy headboard project? Hello! I’m new to crafting and am looking into making my own upholstered headboard. I have a queens size bed and would like to use 18×18 squares. My thought was to use 1/2in thick squares and omitting the supporting back board. Flush mounting them to the wall using a wall cleat. I have a theme in mind and have been searching for cost efficient options for durable/quality fabric. Any thoughts on using curtain panels vs fabric by the yard? Do you have any recommendations about which fabric (linen, cotton, ect.) Is best suited for diy headboard project? Yaaaay! Send us a pic via email! sawdustandembryos@gmail.com… can’t wait to see it! Hi! If you were to do this for a king size bed, what would your measurements be? Would your backboard still be the same measurement? This looks so amazing, I can’t wait to do it! I love this and can’t wait to try it!! We now have a headboard. Thanks for the diy tutorial. I just wanted you to know that I made my headboard and FINALLY got it installed. Hubby installed 3 pieces of wood onto the bedroom wall (exterior wall) with tap cons and we decided to use velcro on the individual pieces of the headboard. Mine is for a king size bed so i made mine 3 rows of 15 x 15 and now I can change out the headboard anytime I want! Wish I could post pics here! Thanks for the tutorial—we’re making a headboard ——finally !!!!!!!!!!!!!!!!! Awesome June! Send us pics when you’re done! Ruthie, just decide approx how big you want your squares to be, and then figure out how many you’d need to fit the dimensions of a twin bed. It’s really just a preference thing. Good luck! Trying to get ideas for headboard . This one is a contender. Not sure about cutting the wood squares . Great instructions. Most don’t have them. Thank You. WOW! I was about to pull the trigger and buy two twin beds for a guest room redo but now Im totally making this headboard! I didnt want another big project because I’m a project junkie but I can bang this out quickly and it is just lovely! THANK YOU FOR SHARING. Haha! You’re so super welcome Audrey! Be sure to send us pics when you’re done!! Hi! I would like to make two of these for a pair of twin beds, but since sometimes I need the beds to be pushed together into a king sized bed, I’d rather have the headboards attached to the beds. One of the twin beds has a regular frame, the other one is a “motion” bed, so it doesn’t have a metal frame to attach to. Do you have any ideas for me to solve this? Sarah, could you attach one headboard to the bed with the metal frame, and have the other headboard affixed to the wall… and just always move the bed with the attached headboard to the other one? Does that make sense? Would that work for your situation? I’m not familiar with motion beds, so it’s hard for me to make a suggestion on that. How do you get the headboard attached to the wall? Do you have an estimate on how much polyester fiber fill I would need to purchase? Looks like you can purchase it by the pound? Thanks. June this was so long ago I don’t still have that bag of polyfill. But it was just a large bag that you can get at walmart. I didn’t use all of it. You could always wrap your wood in batting (like the kind for quilting) like I did for mine!!! Do you know if this headboard would stay standing upright if I extended the 2nd board (the one the squares are glues onto) down to the floor? I can’t mount anything on the walls as I’m renting but really want to give this a go! Hi I just completed this project but I am having a problem with the liquid nails…its not sticking! Its been about a half hour now. Any other ideas? LOVE IT! Am going to give this a go. Have my material ready, off to get wood supplies – any recommendations for staple gun? First DIY project!! Yay! Good luck! 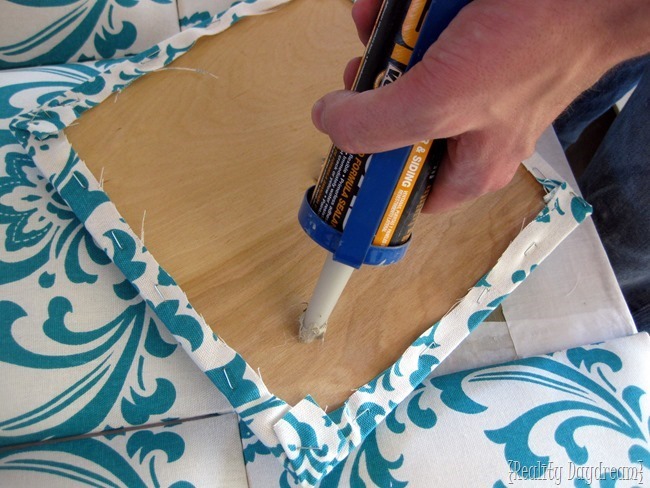 We use a heavy duty Upholstery staple gun from Hobby Lobby. As long as it’s specifically meant for upholstery, you should be good. Send pics when you’re done! Holy cowwww! That looks awesome! And good call on nailing them right to the wall… with it being an RV and all that jostling around. 🙂 And your backsplash… LOOKS AMAZING! Isn’t it crazy how a couple simple changes can make such a huge difference in a space? Thanks for sending pics! I love this it is so pretty! I’m redoing my bedroom right now and need a headboard so this is my answer!! Thank you! Yes! Thanks!! I will do this!! Hi there! I’m having a measurement issue! So, I’m working with a cal king. I understand the measurement should be 72″ in width, with a 70″ backboard. Problem is, I don’t know if I should change the measurements of the squares from 10×10 to something else, or simply have an exta (8th) square across. Maybe I Should have a 2″ boarder? What would you do to make this work? Hi Mia! I think having a wider headboard is better than having a slightly too-short headboard, and would even make your bed look more ‘grand’!! I would do 11″ squares… making your headboard 77 inches wide (and make the backboard 75″). Does that make sense? hye beth…. your tutorial is really fascinating. do mind if i wanna shared your tutorial in my blog?? 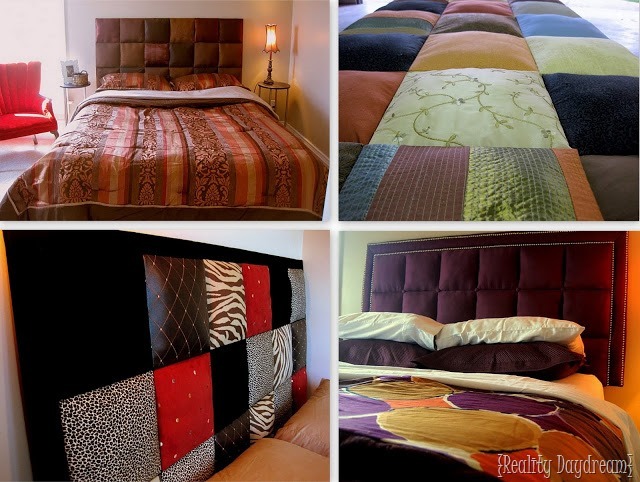 really wanna try make my own headboard. Hi Saedah! We’d love it if you linked to our tutorial, but would prefer than you didn’t share the whole thing on your website. We’d love to see how yours turns out! Be sure to send us the link!! Good luck. how many yards of fabric were needed for a queen bed? Fabrics come in different widths, so I can’t tell you how much you’ll need. As I mentioned in the tutorial, you’ll need (18) 13×13 inch squares of fabric for a queen size. So you’ll have to do the math yourself based on the width of your fabric. The screws that come with the flushmounts are not very long…did you buy longer ones for the wall side? We were fortunate enough to get the flush mounts into the the studs when we installed it over the window; but before that we just mounted the headboard to the wall. You can try it and if it doesn’t seem stable use a drywall anchor. Below is a link of a anchoring screw I have been wanting to try. I just finished spray painting the plywood, now for it to dry and attach the squares! I’m sooo excited! I’ll send you a pic when finished. I do have a question though. Do the interlocking flushmounts have to be on studs in the wall or are they strong enough just in the wall without being exactly on studs? I’m hoping to mount it tomorrow and the studs are not exactly in ideal places for mounting. thanks again!! I already bought the wood! Im so excited!!! I’ve been meaning to dress up an old headboard and your tutorial is perfect. Thanks! I LOVE the headboard with the animal print! How did you make the black border? Love the turquoise and chocolate together. I just painted my bedroom chocolate brown with white doors, trim, bookshelves, and white gauzy curtains. I’ve accented in shades of turquoise and hint of lime green. I love it. Hi Vicki, I wonder why the link wasn’t working. Here’s the tutorial for how to instal your headboard over the window! This is a fantastic idea! I wanted one of these for my dorm so I could give some kind of style to my concrete walls and twin bed. I was looking at a website and found a headboard very similar to this but they were selling it for $1000! That was a definite no so I just said forget it. 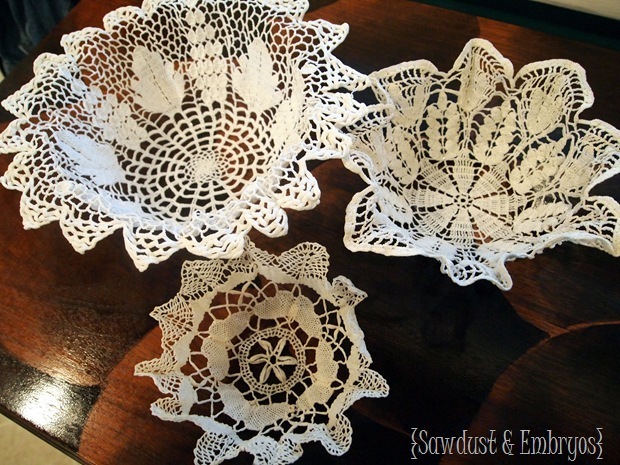 I’m so happy I found this I so I can still make one but I just don’t know what color to use. I love this idea! I really like the one in the pictures above with the nail button border and buttons betweens squares. Do you have tutorial for that one or can you share how you made that one? Your blog is awesome! Glad I stumbled across you on pinterest! Has anyone tried this with a full size if so,what were the measurements? We globbed the liquid nails on pretty thick, and made sure to put it where the staples were so the glue would have something to really grab onto. And it wouldn’t hurt to put some weight on it while it’s drying. Could I use the same measurements as a queen for a full? just finished a queen size and are having trouble keeping all the square adhered and are using liquid nails. should we really glob it on? did you put something on top to apply pressure while drying? This is gorgeous! I especially love the fabric you chose. I am loving your blog! Great job! I’ve got the same type of room where I want to place a bed in front of the window. I’m still trying to get it in my head how you did this? 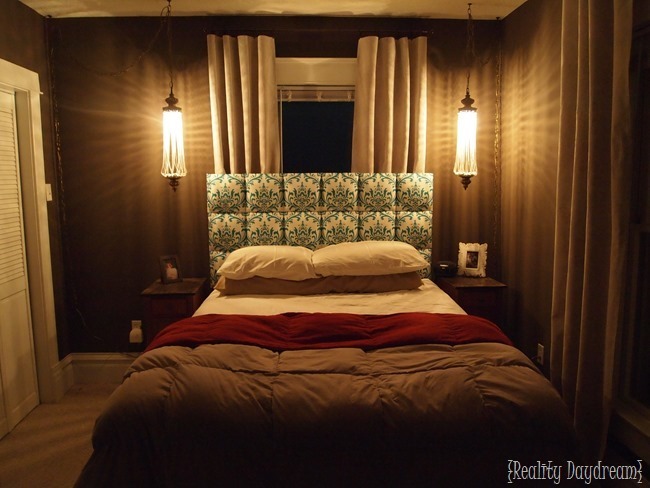 From the photo of your headboard it doesn’t appear that there’s room on either side of the curtains for the 2×4’s. I don’t see the pictures you refer to in the link shown. please help …lol! 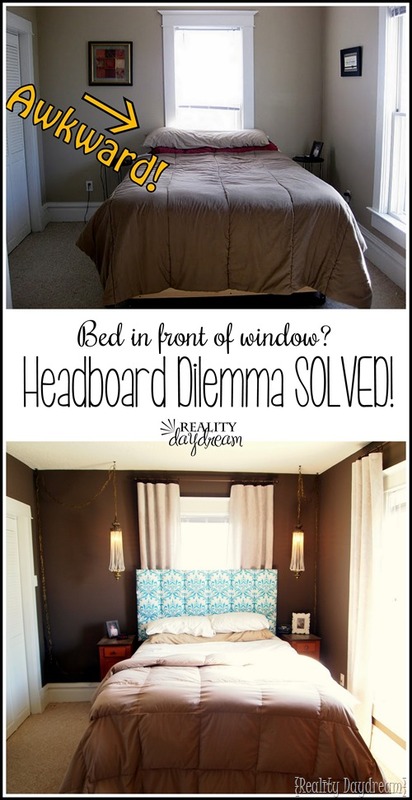 It looks like in the last pictures your headboard is in front of a window. If not, do you have any ideas on how to do this type of headboard for a bed in front of a window? How would you attach it? Awesome! Email us pics! We’d love to see it! Thank you so much for this idea, we just finished ours. And for those wondering how much it costs, we spent about $80. We got 3/4 yard of 4 different fabrics. It was a lot of work, but fun! Or is there a different way to maount it or keep it standing? I’m definitely going to be trying this over summer! I’m hoping to redecorate my room…so I’ll have to bookmark this. Thanks! I LOVE your headboard, but more than your headboard, I LOVE THE LAMPS!!! Where did you get them from? And an idea for the person that is making the removable squares….you could might use the rigid foam insulation and cut it to squares. 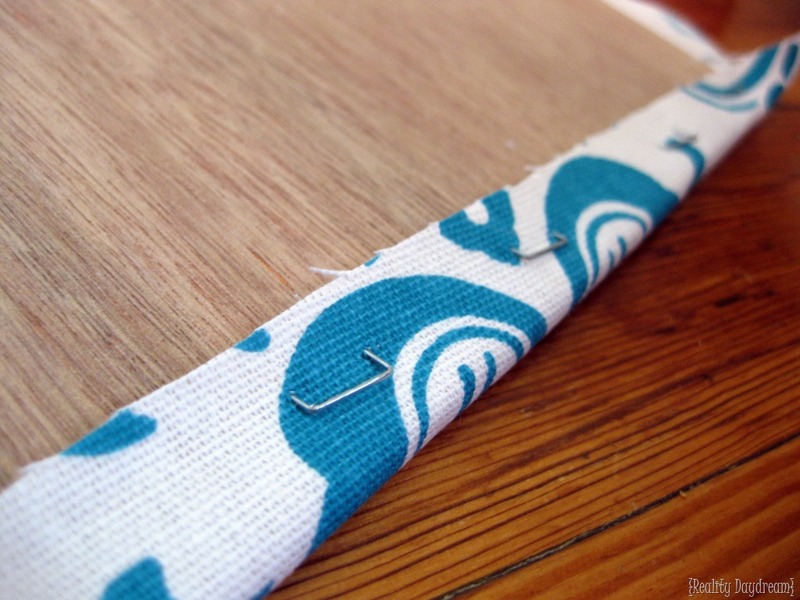 You would have to glue and staple the fabric, but it would be lighter for your velcro to hold. And could use a piece of trim around the bed to help support the squares. Thanks for the beautiful inspiration…And the lights!!! Hi! 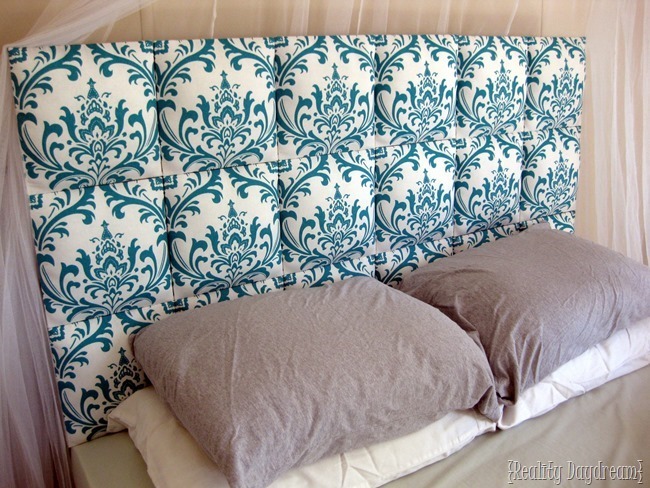 Wanted to tell you that I LOVE your headboard, and you did a great job! LOVE the fabric you used! 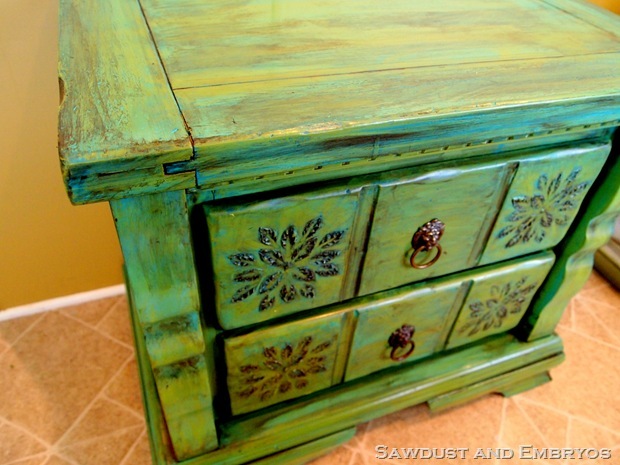 I’m featuring this on my Friday’s Fabulous Furniture Finds at Chase the Star! That’s so beautiful! i love the fabric you chose! Great job! I’m sure if it was sanded down, it wold work fine! I absolutely love this project and want to know if it’s possible that the little boards would stick on to an existing headboard by using the liquid nails if the headboard were sanded down or primed. Help! Lol Thanks! you had me at the title of your blog! 🙂 LOVE IT!!! and then this headboard OMG! can’t wait to make this for our bed ….sooner than later I hope…we are remodeling our house to sell and build a new one…so not so sure it will be soon…but it will at least be on my Pinterest board…waiting 😉 thank you!! Where is this fabric from? I love it!!! I did this for a king sized bed, I made mine 78×38. It was 8 squares across and I made it 4 squares down, I have a big wall to fill, so I actually ended up with 32 squares. I also changed it up a bit by using velcro for the squares so I can change it periodically. Hopefully it will work or we will be waking up with our squares on our heads. Your backboard is 2″ smaller in both length and width than your 18 squares. Did they stick out over the edges? Is that how you wanted it? that’s absolutely how we wanted it. otherwise the tacky unfinished backboard peeks out from behind. we just wanted a crisp line of upholstered squares on the edge. I’m currently trying this on a king size bed, I’m very nervous though, I picked a dark gray and an ivory, one has a pattern the other does not. Thank you so much for the tutorial. 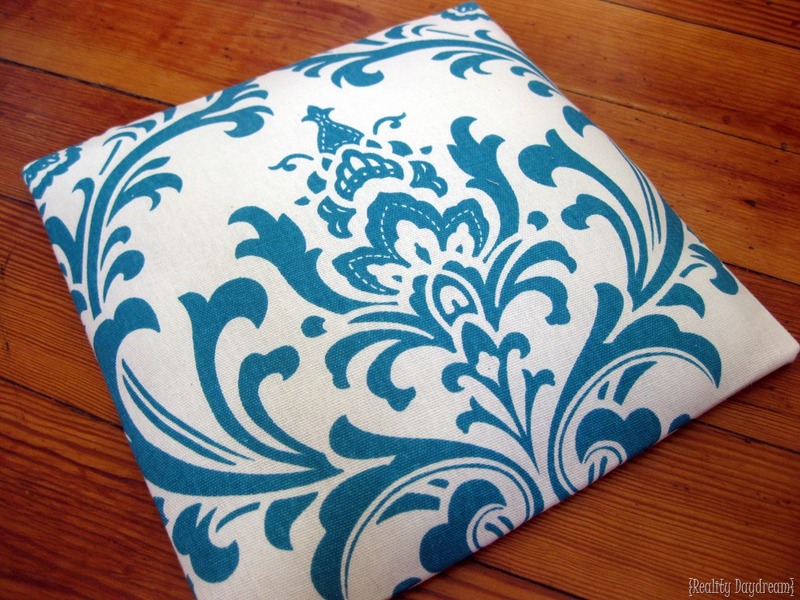 I saw a similar project on an HGTV show many years ago using plain fabric with a sheen on one side and they alternated the squares with mate and sheen fabric. I’ve searched the web for days, but nothing. This morning I found you on Pinterest….yeah and thanks! I AGREE. You both need your own show on HGTV or DIY network! Has anyone done the math on supplies for a king-size? How many yards of fabric did it take? for those of you inquiring about bed sizes, i use this website as a reference. I’m sooo happy I found this on pinterest. 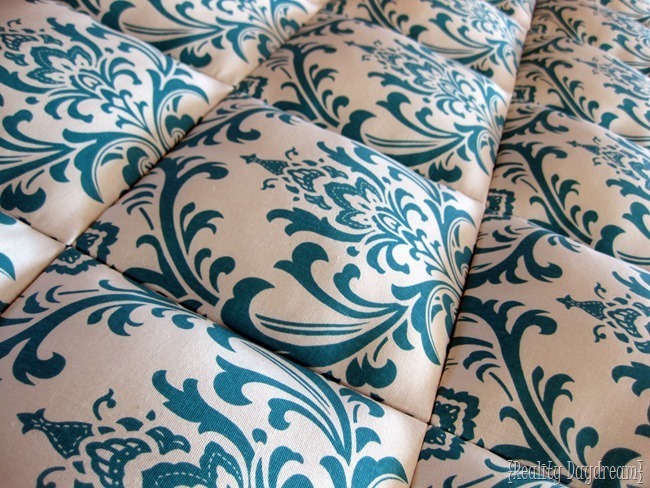 I have damask fabric that I have wanted to make a headboard out of for over a year. This is so cool. I’m looking for a headboard for our new king bed and this might be the winner! Hi Nancy, here’s a link where you can find the fabric we used. Hope that works for ya! good luck! This is my new project!!! I’ve been looking for a headboard for awhile now and came across your site through Pinterest and this is EXACTLY like what I’ve been looking for! 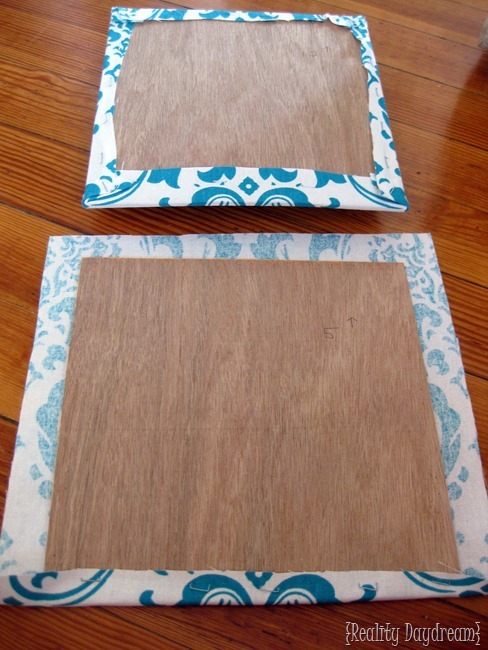 And I’ve been interested in getting crafty for awhile so this is the perfect first project :). Thanks! We made this headboard last weekend! I’m so thankful (hehe) for this blog! You have the greatest ideas, and the best tutorials! It was so easy to follow and I’m so happy with how ours turned out! I was able to use coupons for both the fabric and the other supplies and the estimated cost (queen) was about $40! The one I wanted in the store was over $500, so I’m so pleased! Thanks again!! Wow that is fantastic! Looks amazing Will you come make me one? Do you have an estimated cost for this? I love it! 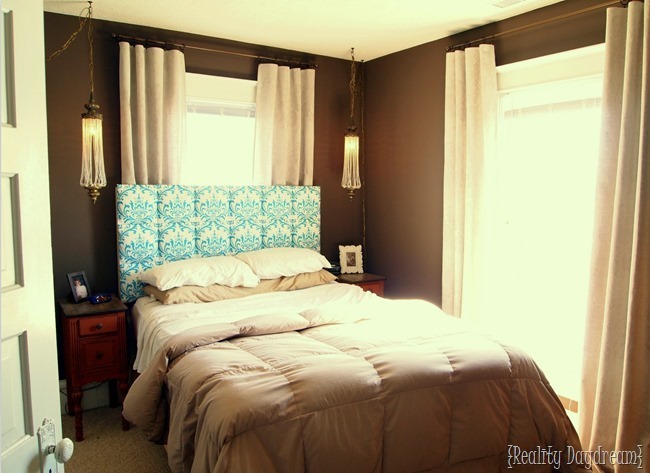 LOVE IT, I have been looking and looking for headboard ideas, this is making the list! like i said in a previous comment, a king size bed would be 76″ (opposed to the 60″ for a queen) unless you have a california king, and then it would be 72″. you’ll just have to decide how big/how many squares you want. Hello, you have so inspired me!! Can’t wait to try this! I know you mentioned 28″x58″ and 18 squares for a queen, may I have measurement for a king? Thanks! We cut the backboard to be an inch shorter on all sides so the squares overlap and the backboard doesn’t show at all. How do you give the SIDES of the back board a finished look…won’t they be exposed? a king size bed would be 76″ (opposed to the 60″ for a queen) unless you have a california king, and then it would be 72″. good luck! send pics when you’re done!!! Nikki, for the headboards with the border, we just cut the “back board” to be larger, and upholstered the edges (about 4 inches on all sides) before we attached the upholstered squares. We used some batting under the fabric to make it kinda puffy too. Anonymous, like we mentioned in our post, we use interlocking flushmounts to attach it to the wall. what have you found is the best way to mount this to the wall? Love this! Was just telling my husband at dinner tonight that a headboard was my next project (after we finished turning a vanity desk into two nightstands that is!). He said it would be hard, and I said no way! Though I really wasn’t sure how true that was… Until now! We could totally do this. Now just gotta measure out for a king bed, and decide my fabric. Quick question, the ones with borders, how did you do that??? I’m thinking you just covered it on the back board? Am I close? Thanks for sharing!!!! nope! doesn’t matter what kind of wood! good luck! and send pics when you’re done!!!!!!!!!! 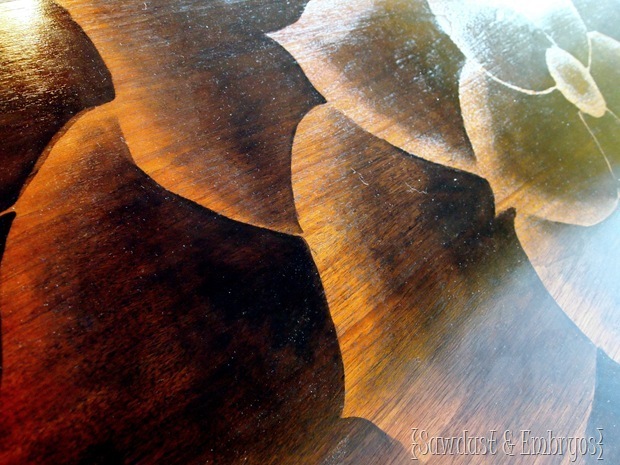 Does it matter what kind of wood I use? Thanks!! I am doing mine for a King size bed so we’ll see how it turns out. Thanks again for such a great idea! We just used two flushmounts. Email us pics when you’re done! Let us know if you have any other questions… can’t wait to see it! I LOVE it too! I am going to make one next weekend… How many interlocking flushmounts did you need to secure it to the wall?? Thanks! That looks SO easy! I love how it turned out with the sheer fabric hanging down beside it. Beautiful! Love it. Awesome fabric for this project. Love your blog! I’m your newest follower thanks to my college roommate Bonnie Schaul Panicko! She said I absolutely had to check you out. You are so inspirational! I have A MILLION little projects around my house I want to try because of your tutorials and making it look so easy! I DEFINITELY need to try this…my room is looking pretty sad! Thank you thank you for the tutorial! WOW…I am SO IMPRESSED, that is BEAUTIFUL! I wish I didn’t already have one million DIY projects to work on!!! I would totally do this! I am definately giving this a try!!! I need some major help in our guest room and this just may be the ticket!